On March 20, 4 years ago, Archion has completed the beta phase and started live operation. Celebrate with us and take advantage of the Archion anniversary offer − available until 1-May-2019. It's great that more and more archives have joined us since the launch of Archion, presenting their church books online. However, the list of archives has become longer and more confusing. That's why we've changed the names: first the region is named and then the name of the archive. The regions appear in alphabetical order. Initially it will be a transition for you as a user, but we hope you will quickly get used to it and appreciate the benefits of the change. 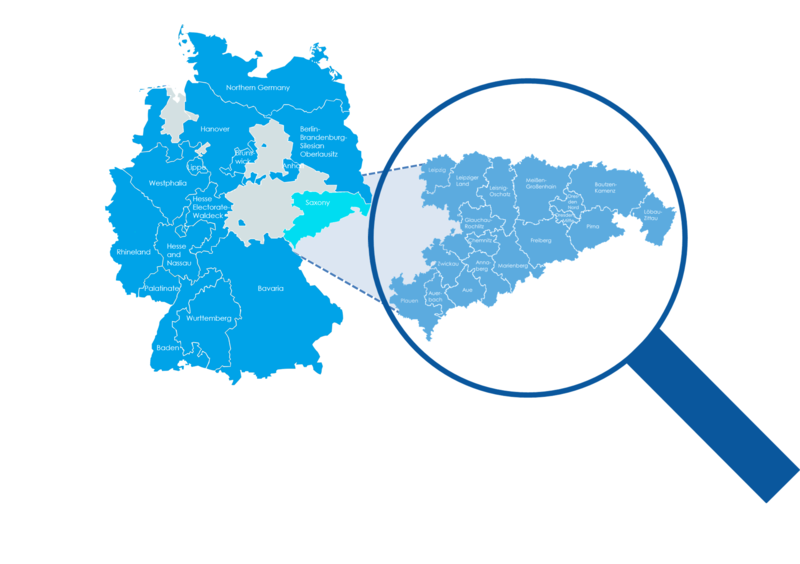 At the turn of the year the church records from Lower Saxony church district of the County of Schaumburg were newly added to the online inventory in Archion. With more than 400 historical church books from 85 places the inventory offers a colorful mix of church records, civil registers, alphabetic registers, originals and duplicates, and is available for research. From October, the Evangelical Lutheran Church in Oldenburg will present more than 1000 digitized church records via Archion. With the publication of church records of the former state of Oldenburg, baptisms, marriages and deaths can be researched online for the first time from the 17th to the 20th century. This is possible because the archive of the Regional Church of Oldenburg has also collected church records for backup filming and subsequent digitization, which were previously only available to the individual parishes. Among the 82 towns that will go online, you will find the city of Oldenburg as well as the mid-sized towns of Delmenhorst and Wilhelmshaven. Another import with more than 400 church records from 18 parishes is planned for 2019. We are often asked whether Archion could be tested for free. We think that this desire is justified in many ways and absolutely understandable. After all you want to know what to expect from family research with Archion. Experience, investigate and explore the digital church record research with our testing site HILDRIZHAUSEN. Without login, registration and without providing any personal data – non-binding and without any risk. Then quickly visit Archion and browse through church books of the oldest suburb church of Dresden. Earlier than planned, we can already present the first church books of Saxon Regional Church to you. Therefore, we can again go one step further in supporting you in the efficient search for your ancestors. All released church records of the Protestant Lutheran Church of the Palatinate are available online! Rejoice with us! Around 3600 church records of the Protestant Lutheran Church of the Palatinate are researchable online now. Together with the church records, that are stored at Landesarchiv Speyer, the area of the State Church of Palatinate is almost completely covered. The central archive also endeavors to obtain approval from the political municipality to put the church records in Archion that are lying in city archives, registry offices or mayoralties. At the end of each calendar year the church records that are not in a retention period anymore are added to Archion and released for use. The Evangelical Lutheran Church of Saxony is going to present their church records on Archion. The archive responsible for the Saxon Regional Church is already working at high pressure on the preparation, cataloguing, filming and finally digitizing of thousands of historical church records. The focus is on the security filming of the church records originated until 1875, what already took place for 25 % of the church records. Books which are stored in the respective rectories are especially prepared for this elaborate large-scale project and brought together for the filming. Then digitized from film. All these steps of course need their time. Nevertheless, we can present the first historical church records from Saxony already by the end of 2018 to you online. The Evangelical Lutheran Church of Saxony is one of 20 member churches of the Evangelical Church in Germany (EKD). The territory predominantly includes that of the former Land of Saxony within the borders of 1922. At the moment 719 church communities and parishes are belonging to the Regional Church, each assigned to one of the 18 church districts. More than 400 digitized church records, mainly from Palatinate and Rhine-Hessian parishes, are now available online in Archion. Catholic, Lutheran and reformed church records list baptisms, weddings, funerals and confirmations and primarily include the period from 1565 – 1798. Besides this classic information the inventory includes further interesting directories concerning family history. Especially researchers that are interested in local history get their money’s worth: numerous additional lists inform about conversions, migrations, local and church chronicle, about weather and harvest. The majority of the new inventory assembles church records that originally emerged in various parishes and came to Landesarchiv Speyer through municipal administrations. With the presentation in Archion it is now possible to make this historically valuable inventory available online to all interested people. In collaboration with students of an animated film class of an academy of arts and the association of church archives two 90-second animated films were created this summer. In an English and German version, they show how Herr Nolte and Mrs. Smith immerse into their family histories. During conception it was important to us to demonstrate the possibilities, that arise from Archion for family research, but also to show the limits and state clearly, that not every detail of family history is reconstructable. But due to the constantly rising number of original documents, Archion provides the best opportunities to Herr Nolte and all curious people, that want to discover their own roots.